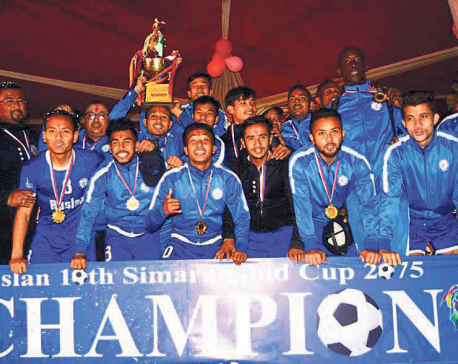 BARA, Jan 24: The departmental team Tribhuvan Army Club has advanced into the final of the ongoing 10th Simara Gold Cup football tournament with a 1-0 win over the host Simara’s Nawa Janajagriti Yuwa Club in Simara on Wednesday. At the Simara Stadium, a second half goal from captain Bharat Khawas sealed the win for Army. 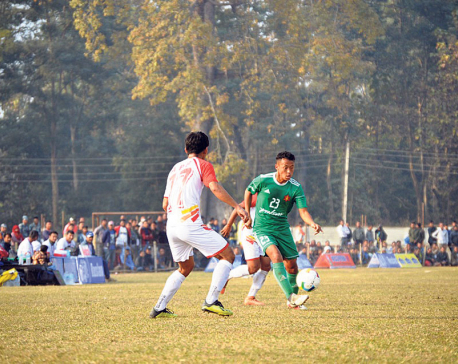 Khawas converted a pass from Sesang Limbu in the 50th minute to score the decisive goal in the game. Simara players played really well dominating Army from the start and did not give the opponents enough chances to hold on the ball till the last minute of the game. Simara got a good chance in the 12th minute to score, but could not capitalize on it. 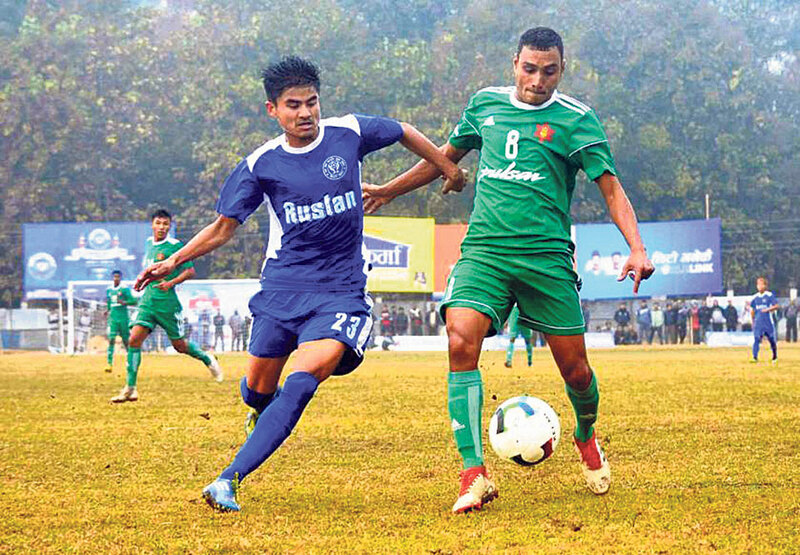 Suraj Thakuri hit a 25-yard free kick, but Army’s Tanka Basnet cleared the ball denying Simara the lead. Four minutes after, Simara got another set piece chance as Prajwal Thapa Magar’s free-kick was punched over the crossbar by Army keeper Bikesh Kuthu. Simara was able to hold Army to a goalless draw in the first half, but conceded one just five minutes into the second half. Simara’s Niraj Thapa Magar got a wonderful chance to equalize the game, but his one vs one chance went wide after receiving a pass from Prajwal Thapa Magar in the 55th minute. Goalscorer Khawas got a good chance to score in the 60th minute as he dribbled the past from the center line, but his shot was easily dealt with by the host keeper. A good defensive display by Army’s Jitendra Karki denied Simara an equalizer. Simara’s Niraj Thapa crossed the ball to Sunil Khadka, but his header was cleared by a defensive header from Karki in the 70th minute. The winner of the second edition Himalayan Sherpa Club will take on the last year losing finalist Three Star Club in the last semifinal match on Thursday.